On April 11/12/13 2011, a meeting is scheduled in Vienna concerning two Working Tables: Public Procurement (see in attachment a provisional agenda and the related template) and Portfolio Management (click to read a provisional agenda and the template). The 4th PuRE-net Annual Conference took place in Helsinki, hosted by Senate Properties on September 5-7 2010. The venue of the meeting was the Hilton Helsinki Strand Hotel. 13 countries attended: Austria, Czech Republic, Denmark, Estonia, Finland, France, Germany, Italy, The Netherlands, Norway, Spain, Sweden, United Kingdom. Overview of the 2009/2010 PuRE-net activities and proposals/programmes for the next year. In that respect it is important to highlight that a new framework for the existing and future working tables has been defined. Election of PuRE-net President and Steering Committee. Mr. Carlo Petagna (Agenzia del Demanio, Italy) is confirmed as President for the next two years. The Steering Committee is made up by the following member countries: Czech Republic, Denmark, Finland, Italy, The Netherlands, United Kingdom. Preliminary discussion concerning the definition of the PuRE-net legal status, by verifying the opportunity for registering PuRE-net as an association based in Finland. The registration of PuRE-net is of paramount importance to allow the network to build up economical and commercial relationships. The conference also saw the participation, as observers, of some organisations belonging to the TWN international network. Some preliminary discussions were made concerning possible ways of collaboration and cooperation between PuRE-net and TWN. Agenda, presentations and Conference documents are available in the PuRE-net Virtual Headquarters inside the Annual Conference building. The 4th PuRE-net Annual Conference will be hosted by Senate Properties in Helsinki on 5-7 September 2010. The conference will be held in the Hilton Helsinki Strand Hotel, located just half a mile from the city center and close to Senate HQ. Please see Senate Properties web pages to find the updated Workshop Agenda and the Workshop Registration Form. The first meeting of the Working Table on IT Systems has been hold last April 16 in Paris. Six countries attended: France, Belgium, Czech Republic, Italy, Netherlands, Spain. Unfortunately, due to the flights stop caused by the volcanic ash cloud, Estonia, Sweden and United Kingdom were not able to reach Paris to join the meeting. The second meeting of Cultural Heritage Working Table is scheduled on February 4 and 5 in Rome. The meeting is hosted in the Agenzia del Demanio headquarters and collects Netherlands, Sweden, UK and Italy: every country presents a cultural heritage redevelopment project. In the two-days programme are also planned: a presentation by HERITY (a non-governmental organization with headquarters in Rome) about Herity Global Evaluation System (HGES) to classify monuments, museums, libraries, archaeological sites and archives after they obtain the International certification according to the system; a guided tour to two cultural sites certified by Herity; a workshop on retrievals and anti-trafficking operations carried out by the Carabinieri Special Cultural-Heritage Task Force in charge of protecting Italy's artistic masterpieces. The 3rd PuREnet Annual Conference took place in the spectacular scenery of Kronborg Castle, last 28 and 29 September hosted by the Danish Places and Properties Agency (SES). The Castle – located in Elsinore, 50 km north of Copenhagen – is one of the important Renaissance castles in northern Europe and it’s famous worldwide from Shakespeare’s play Hamlet. During the crowded with work two-days meeting, the participants (from sixteen countries) to the conference shared their presentations, joined them in several tables discussions and in specific themes working groups. The overall theme regarded the new tendencies in public real estate administration, particularly focused on energy, financial crisis, cooperation between public sector and building and construction sector and market. Moreover, the conference produced several ideas and suggestions concerning possible improvements to be carried out for the network itself, especially on working tables: with regards to this, proposals will be worked out. The hard work of the conference was rewarded by an afternoon guided tour of the castle and by a Danish dinner in Eric of Pomerania’s Chamber with harp background music. Presentations, pictures and other Conference documents will be soon available in the PuREnet Virtual Headquarter inside the Annual Conference building. The 3rd PuREnet Annual Conference will take place at Kronborg Castle, Elsinore (Denmark) on 28-29 September. The conference will be chaired by Carlo Petagna, Italy, and Carsten Jarlov, Denmark, supported by Maurizio Travaglini, Italy. 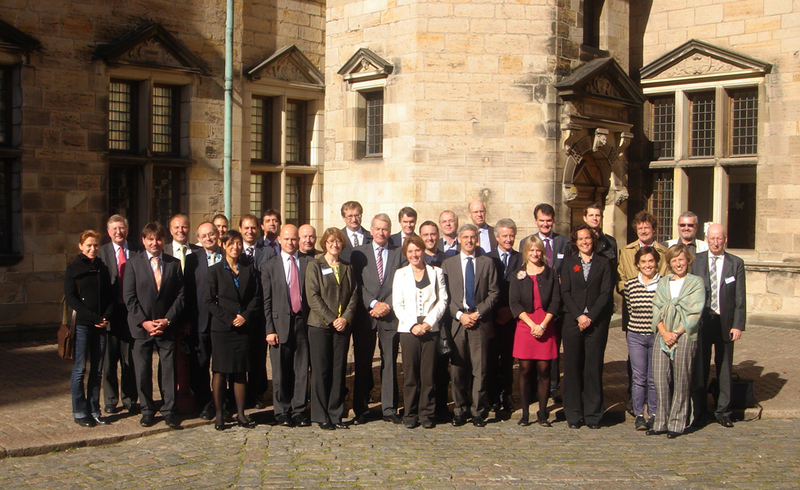 During Athens, Vienna and Stockholm meetings in June 2009, network members compared their experiences on “Redevelopment & Corporate Social Responsibility”, “Public Procurement” “Strategic Performance Management Systems and Tools” and “Building Performances”. Main results and other material from round tables discussions are now available in the ‘Activities’ section. June 15-16: the first workshop on the theme "Redevelopment & Corporate Social Responsibility" hosted by KED in Athens, at the Royal Olympic Hotel. June 22: a one-day meeting on “Public Procurement” in Vienna. Key issues focused on energy efficiency services, and private partnerships for redevelopment projects (PPP) according to public procurement law with a special focus on the recent developments in the case law of the European Court of Justice. June 25-26: members meeting in Stockholm for the 4 th meeting of the working table “Strategic Performance Management Systems and Tools”, chaired by Denmark and the 3rd meeting of the working table “Building Performances” chaired by UK. For meeting’s agendas and further information please go to activities section. As scheduled, the Second Annual PuRE-Net Meeting took place in London, December 10-12 hosted by the OGC organisation. 15 European countries attended the meeting and also a delegation from the Brazilian Government participated as observer. The delegates met on Wednesday evening directly at the OGC Office, located within the very impressive and imposing HM Treasury Building. The 2-day agenda covered all the many activities (working tables, small working groups, exchange programmes, etc) and meetings that were carried out and held in less than 12 months time, but it was above all focused on two of the main working tables (Table 3 Strategic Business Performance and Table 5 Building Performance). Also new subjects were discussed for possible future working tables such as: European Space Measurement Standards, Conservation & Management of Public Historic Estate and Environments, the National Government as an Active Developer, Public Real Estate as key issue for urban development initiatives and, last of all, Public Procurement and Global Sustainability. During the conference many important decisions were also taken in order to consolidate the future of the network: a formal PuRE-net Constitution and Working Methods was outlined; it was decided that the network needed a formal Steering Committee with a President chairing it, both elected on a 2-year basis. All delegates decided unanimously that Carlo Petagna, Deputy Director of the Italian organisation Agenzia del Demanio, will be the first President of the Steering Committee for the first 2-year term, on the basis that he started the network project. Furthermore, the following 7 countries constitute the first Steering Committee: Czech Republic, Denmark, Finland, Greece, Italy, Netherlands, UK. Last of all, Carsten Jarlov, Director of the Danish organisation, kindly offered to host the Third Annual PuRE-Net Meeting in Denmark in September 2009. Another element that made the conference a real pleasure was the special locationschosen by Mike Burt and his staff for the different settings of the meeting. The conference has been hosted at the Admiralty House, the former residence of the First Lord of the Admiralty, also known as the “smallest Grand House” in London, created for the Lords Commissioners of the Admiralty, which is today owned and managed by the Cabinet Office and is especially used for public conferences and Cabinet functions. Other surprises that enriched the 2-day-stay were a private tour of the Tower of London and the Crown Jewels, topped off with another private tour – usually not opened to the public – of the Parliament Houses. Last treat was the location of the Gala Dinner, held in the House of Lords, and hosted personally by one of the Lords, Lord Howie. Working Table in Helsinki, September 22-23 2008. Agenda focuses: Theme N.3 (Strategic performance management systems & tools), Theme N.5 (Data collection, management and utilisation to improve building performances) and the comparison among the different organisations regarding “Public Procurement”. All documents regarding this meeting can be downloaded in the ‘Activities’ section.